Smiley Pie Face! 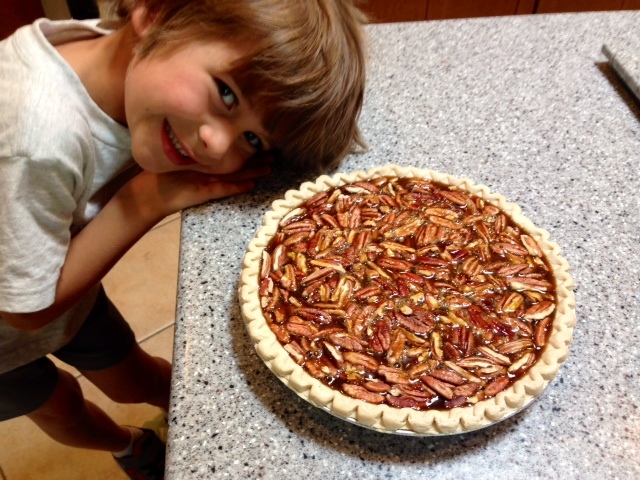 A kid friendly pie pecan. This Summer I have decided that Azul and I are going to do as much as we can, and sometimes one activity leads to another. 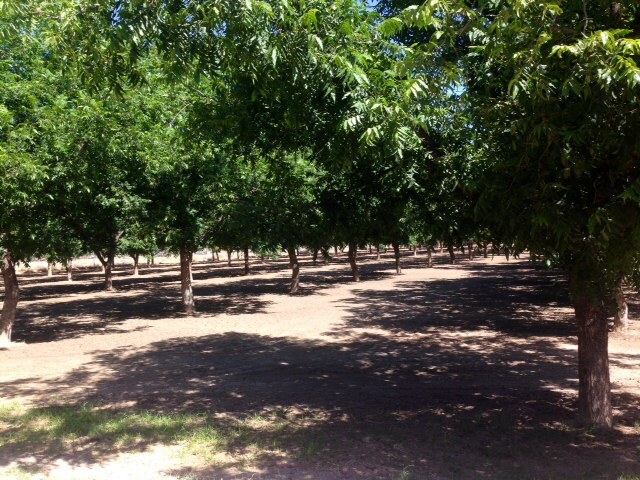 Luckily, I have an aunt who owns a pecan farm in Southern New Mexico, so visiting her was on our Summer break list. We stayed the weekend and had a blast! 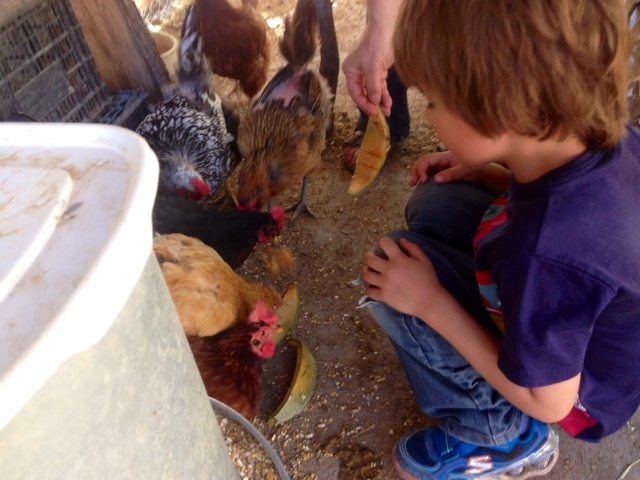 Azul was able to interact with the animals, feed the chickens and collect their eggs. He ran in the mud in-between the freshly irrigated pecan trees. 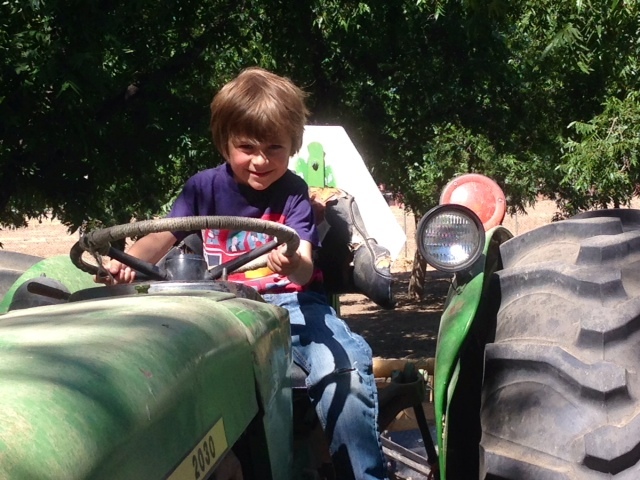 And he was able to get on the tractor. We made out like bandits that weekend, and upon our return home we relished in all our booty. The next question was, what do we do with all of this? After much consideration, we decided to make pies. This was not on the original Summer break list, but a welcomed addition. This recipe is from America’s Test Kitchen. It’s super kid friendly and delicious. 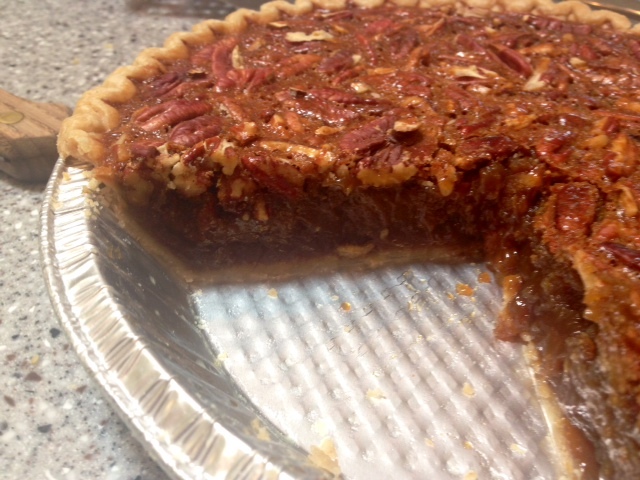 Of course, you don’t have to visit a pecan farm in order to complete this recipe and bonus, no corn syrup needed. 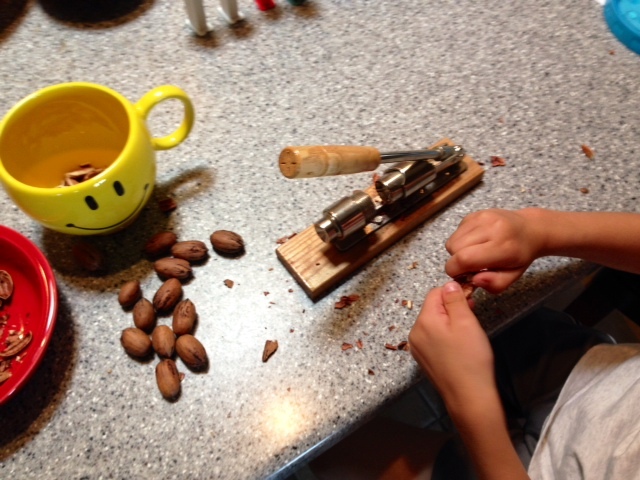 Step 1 – Shell the nuts (if your nuts are shelled skip to Step 2) This took us about an hour and my little helper started strong, but after about ten minutes he said with a stretch of his arms, “Ahhh! I need to take a break.” And he moved from the kitchen counter to the couch. I continued cracking. I did hear a small voice proclaim, “Nothing’s better than sitting back and listening to nut cracks! How relaxing!” He did say, “nut cracks,” that was not a typo. If you can get your kids to stay longer, more power to you! Step 2 – Pre-heat oven to 450 and adjust the oven rack to the lowest level. Step 3 – Make the filling by heating the syrup, sugar, cream and molasses in a saucepan over medium heat stirring occasionally until the sugar dissolves. Slowly stirring can be a perfect chore for your child. Keep in mind, they’re at the stove. 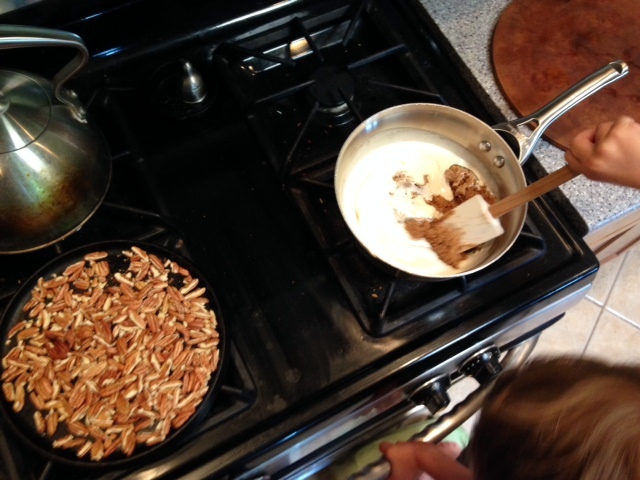 Step 4 – Lightly toast the nuts and remove them from the heat. Step 5 – Remove the filling from the heat and let cool for five minutes. Then whisk in butter and salt until combined. Next whisk in eggs yolks until incorporated. More stirring and more kid participation. Yay! 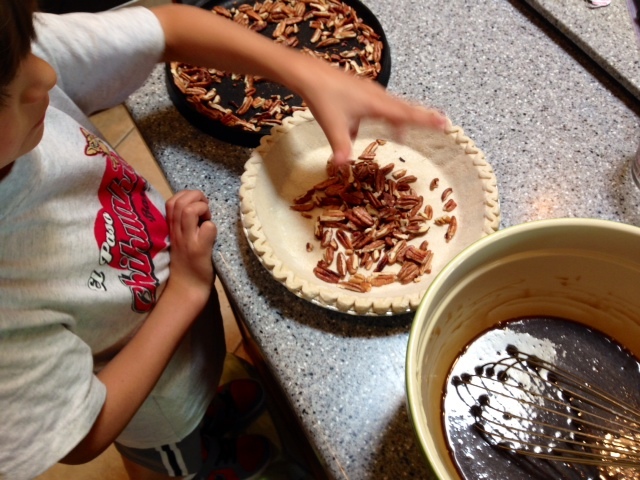 Step 6 – Scatter pecans in the pie shell and carefully pour filling over the nuts. The scattering can be done by your child without any concerns of injury. I suggest you do the pouring. Step 7 – Place the pie in the hot oven and immediately reduce the temperature to 325. Bake for 45 to 60 minutes, until filling is set and center slightly jiggles when gently shaken. This is all you parent. 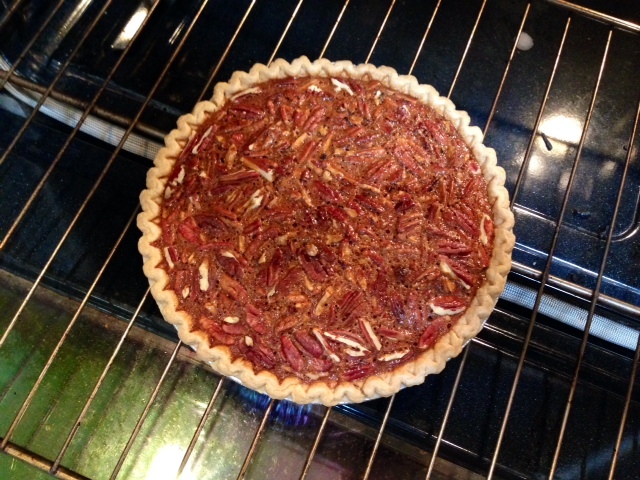 Step 8 – Cool pie on a rack for one hour, then refrigerate for three hours to set. This seems to take an eternity! 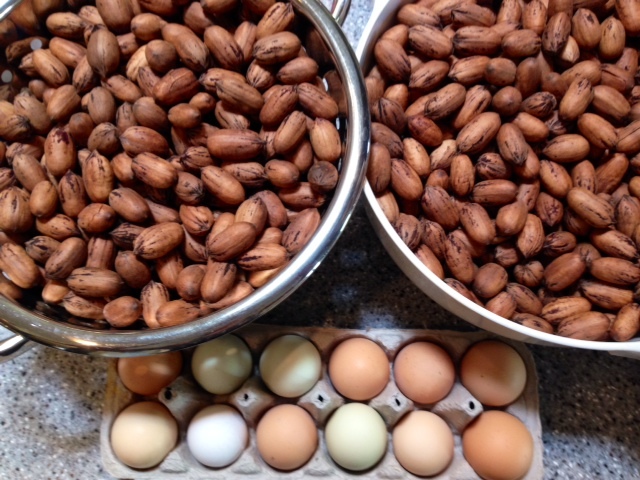 Step 9 – Eat! Bring it to room temperature before serving. Everyone gets to do this. Unless you have a nut allergy! And if you do, this is not the pie for you. It’ll bring a smile to your face!